Well that’s the Scottish leadership election over. There was at least a real debate about ideas and strategy and Neil Findlay’s campaign ensured that we didn’t get the coronation the system usually delivers. Neil also delivered ideas of substance and generated energy amongst party members that I haven’t seen for a long time. From Jim Murphy’s initial announcements it would appear that we are about to get some internal constitutional change. Jim wants a ‘Clause 4’ moment, although it’s actually Clause 2 in the Scottish Labour Party rules. Yes, I know I’m a pedant. Not in this case for some New Labour policy purpose, but to bring Scottish Labour ‘closer to the centre of Scottish life’. The strategy appears to be aimed at dispelling the myths about ‘London Labour’, stoked by the actions of the UK party during Johann Lamont’s leadership. Many in the party will welcome this strategy as long overdue. Even in government there was an unwillingness to shout about the different approaches we took in Scotland in areas like the NHS and education policy. If a Scottish solution to Scottish issues is to mean anything, then differentiation is fine. He set out five principles for this new aims and values statement. The new Jim starts by using the ‘s’ word. Socialism isn’t something he talks a lot about, so that’s a positive start. The new socialism is to be linked with patriotism because our, “political faith grew out of something deeper which is ingrained in our Scottish character”. This is apparently, “A belief that we stand together, look after those who need our help, and make sure that everyone gets a fair shout”. I'm not sure that these are uniquely Scottish characteristics, even if the examples are Burns poetry, highland clearances and New Lanark. Welsh Labour might take issue with us claiming Robert Owen as our own, he was after all Welsh – but we get the drift. Then we get a bit about solidarity across the UK that is complementary to and not in conflict with the Scottish national interest. He says, “We will declare ourselves a party that represents Scotland first, in the community of the UK and the world, and where, as Scots, we work with others to achieve the potential of all”. That seems a reasonable position for a party of devolution to take. He then asserts, “the total devolution of policy making in devolved areas”. Impossible to disagree with, as the existing Clause 15 already delivers precisely that. Recent policy disagreements with the UK party have been over reserved issues like the Bedroom Tax. His fourth principle seeks to commit Labour to a “permanent and powerful Scottish Parliament”. Given the somewhat lukewarm commitment of a few Westminster MPs over the years, this is an eminently sensible approach and in keeping with the founding principles of Scottish Labour. Finally, we get the big policy vision; “we will renew our historic mission for a more equal and fairer society where power, wealth and opportunity are more fairly shared amongst our fellow Scots and our fellow human beings around the world”. I might question the ‘more fairly’ as a bit weak, but again the direction of travel is fine. As a trade union official, I am all too familiar with the new CEO arriving with a glossy new mission statement. It’s a tried and tested management strategy aimed at setting a new tone and direction. As Scottish Labour members are fed up with the ‘London Labour’ label, most will be willing to give this approach a fair wind. A draft in January for consultation will give an opportunity to turn some of the more esoteric phrases into meaningful language. Jim ended his speech in very unNew Labour style, by taking us back into Labour history. To the 1888 founding conference of the Scottish Labour Party no less. His speechwriter should perhaps have checked with the Keir Hardie society, because the great man didn’t actually chair that conference, even though he was the driving force behind it. It was chaired by RB Cunninghame Graham who of course went on to be the first President of the SNP - so maybe he was best air brushed out on this occasion! Jim was however a bit selective in his list of Scottish Labour policy during this period. The founding programme also included the nationalisation of the railways and other means of transit (waterways and tramways) the banks, the land, all mineral rights and the abolition of the House of Lords and all hereditary offices. Now that’s a real Clause 4 moment! Overall, the aim of emphasising the ‘Scottish’ in the Scottish Labour Party is not a bad strategy as long as we don’t lose the socialism with the patriotism. Because it is socialism that distinguishes Labour from other social democratic parties and we should never forget that. There are some big changes to our pensions next year. The Scottish Local Government Pension Scheme changes next April and the UK government is allowing transfers out as a lump sum. In addition, new governance arrangements should ensure that the £24bn in Scottish funds are invested more effectively for the benefit of members. I was at UNISON's annual pensions seminar today that brings together pensions champions from local government funds across the UK. While the Scottish scheme is separate from its England and Wales counterpart, there are a number of common concerns. There are huge variations in the performance of funds across the UK. We simply don't know the true cost of investments and there is not even an agreed set of key metrics so we can compare funds. One speaker gave an insiders explanation of how asset managers try to hide the true costs. He gave us a frighteningly long list! I particularly liked (not) private equity firms who charge the firms they invest in to put one of their staff on the board, which of course reduces the financial performance of the company and therefore the return to pension funds. There are also a range of conflict of interests in the value chain that again add to costs. There was a useful explanation from the Law Commission in England (the law on this point similar in Scotland) of fiduciary duty and what factors you can take into account in ethical investment decisions. In my experience, trustees are given a very narrow interpretation of this because fund managers are not keen. In fairness, the case law is based on some bad factual cases. The Law Commission report shows how you can ethically invest legally using due process. Many decisions can be given a financial gloss and even non-financial factors can be taken into account if you follow the process outlined in their guidance. They also recommend some changes to local government investment regulations that we will need to look at. In particular, confirming that funds should be invested in the interests of the members - not what the councillors think is in the best interests of the council! A key issue is again getting quality data. We should be tagging unethical firms on the investment database so that the fund is notified anytime asset managers invest in them. A number of speakers in the final panel highlighted how effective activist share action can be in promoting ethical investment. Also on issues like executive pay that has spiralled out of control in many firms. The TUC has developed trade union voting and engagement guidelines and organisations like Share Action are also running effective campaigns. From next April, all members in funded schemes will be able to take their pension pots from age 55. What many people don't realise is that they will pay tax at their marginal rate on 75% of their pot. We will need to watch out for pension scams and develop rigorous procedures to ensure members get proper advice. There is also a risk that some funds could suffer negative cash flows. The government says they don't expect many to do this in quality schemes like the LGPS. Although interestingly the government hasn't allowed members in pay as you go schemes like the NHS to take out their pot, because that would be a cost to the government! The coming year is going to be a busy one for union pension representatives at every level. More than 40,000 jobs in Scottish local government are at risk over the next five years if austerity economics continue. 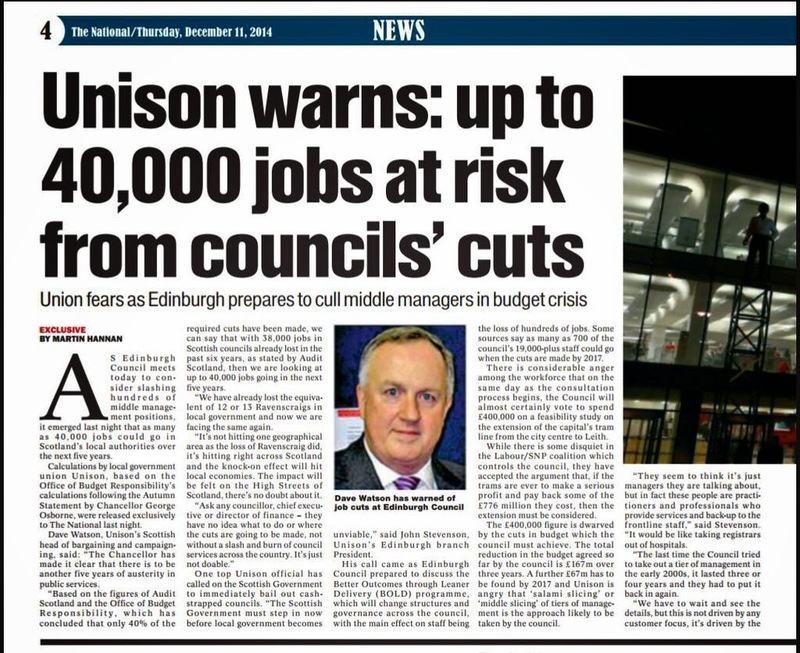 Today's 'The National' newspaper carries a story quoting my estimate of the likely job losses in Scottish councils. It's a headline because the current budget round is highlighting the massive scale of cuts each council is having to consider next year. The numbers are frighteningly huge in cities like Edinburgh and Glasgow, but proportionately the story is the same across the country. So before anyone accuses me of scaremongering, I would point out that our estimates in the past have sadly been pretty accurate. I also suspect 40,000 may, if anything, be an underestimate. 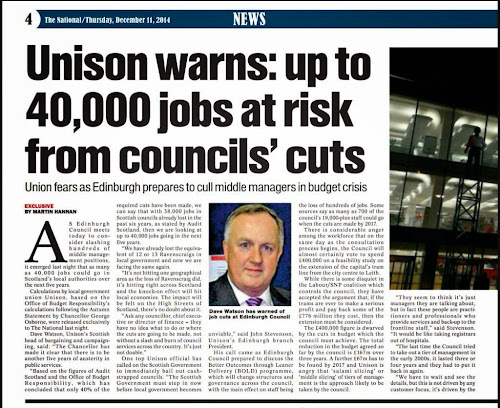 We know that nearly 40,000 jobs have gone from Scottish local government since the crash. We also know from the OBR and IFS analysis of the Autumn Statement that some 60% of the cuts planned by the ConDems at UK level are still to come. Given that there is to be no real change in the Barnett formula, you don't need to be a mathematician to see that our numbers add up. Of course the Scottish Government could stop dumping the largest share of the cuts onto local government. However, that seems unlikely because that would require them to reduce health spending and politicians aren't that brave in the run up to elections. Even if it is council cuts that contribute towards the bed blocking that are causing so many problems in our NHS. They could also use the income tax powers they have and the new ones. However, as we also know from today's Audit Scotland report that only one civil servant is allocated to work on income tax, that seem pretty unlikely as well. While we welcome the attempt to find a cross party consensus on local government finance through another commission, the Council Tax freeze continues. That's £2.5bn which could have been used to save services, rather than give handouts to wealthy households. On top of that we have the small business bonus that has cost a fortune without a scrap of evidence that it has created any jobs. We also need to remember that even if we do fix local government finance that is only a small proportion of council revenue. Councils also have choices to make. Edinburgh's plan looks like another exercise in shifting the deck chairs around the Titanic. The loss of experienced staff, including middle managers, is becoming a real problem and one that even Audit Scotland has commented on in past reports. In many councils, inexperienced and quite junior staff are being asked to make decisions that could have serious consequences for councils and individual service users. Today in Glasgow, staff and service users are protesting at the decision of Glasgow City Council to slash and burn mental health services in the city, currently provided by GAMH. It is rank hypocrisy for the council leader to announce his council's commitment to promote the living wage through procurement on one day, when the next day his council is planning to shift a service from a good living wage wage employer to another that doesn't. Quite apart from the blatant breach of the statutory requirements under s52 of the Local Government in Scotland Act. So, while councils and the Scottish Government can rightly be accused of poor choices, the core problem is austerity economics as delivered by George Osborne. As I outlined last week in a commentary on the Autumn Statement, this is not just taking public services back to the 1930's - it is also damaging the unbalanced economic recovery. If we don't change course after the 2015 General Election, 40,000 jobs may only be the tip of the iceberg. A budget package in December may not be Autumn, but it certainly had a real chill for those least able to afford its consequences. 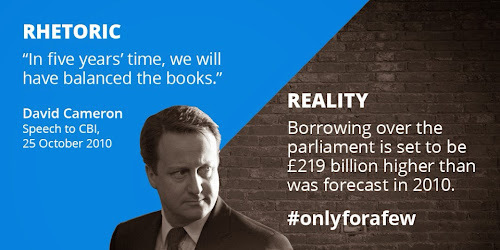 This was a classic Osborne budget statement. Massive real cuts, sugar coated by handing back a few pennies in the form of announcements on the NHS and infrastructure. Yes, Scotland will get £129m of Barnett consequentials from the NHS announcements, but this goes nowhere near making up for the real cuts ahead. 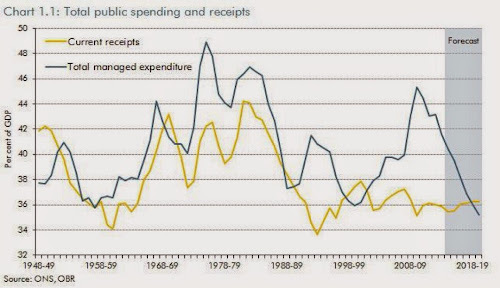 This chart from the Office of Budget Responsibility makes it perfectly clear where public spending is going. "Between 2009-10 and 2019-20, spending on public services, administration and grants by central government is projected to fall from 21.2 per cent to 12.6 per cent of GDP and from £5,650 to £3,880 per head in 2014-15 prices. Around 40 per cent of these cuts would have been delivered during this Parliament, with around 60 per cent to come during the next. The implied squeeze on local authority spending is similarly severe." This is also an entirely home grown consequence of the failure of austerity economics. The OBR also tell us that real earnings will not return to pre-crisis levels over the next five years after a continuous fall since the crash. Pay freezes, low paid new jobs, low incomes of the involuntary self-employed are behind the apparently improving unemployment figures. This is the reason why tax revenues have not grown sufficiently, and public borrowing has increased despite draconian public spending cuts. This infographic from the JRF shows just how the low paid have taken the brunt of pay cuts. And it's public sector workers who take the biggest cuts yet again. Osborne told us proudly that he has halved the deficit. But in 2010 he told us that it would have gone by next year. 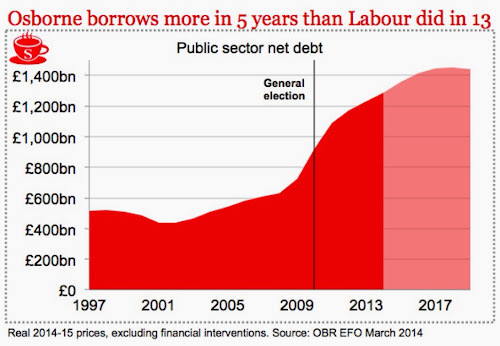 Instead he has borrowed more than Labour as this chart shows. In any case the budget deficit is the wrong target. The UK's main deficit is in investment and equality. We need a massive programme of public investment in social care, public transport, housing, child care and education, which will tackle the investment and decent work deficit. Then we need labour market policies to ensure that the fall in labour’s share of national income in the past decades is reversed, and the recovery is wage-led rather than debt-led. Household debt will grow faster than previously forecast until it’s larger than before the recession. In simple terms, take care of full employment, decent pay for women and men, equality, and sustainability, and the budget will take care of itself. 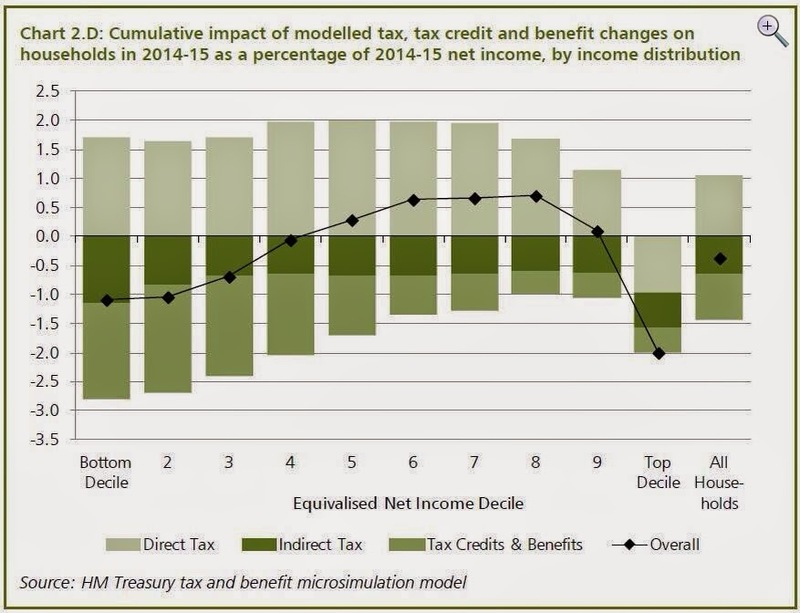 If you were in any doubt about the political strategy behind the Autumn Statement, have a look at this distributional analysis. The top 10% will vote Tory come what may to protect their tax cuts that are threatened by Labour. The big losers are again at the bottom, the 'dog end voters in the outlying regions' as one Tory MP put it. Osborne’s economic policies have been deliberately designed to shift money from the poorest to the richest. Research from the London School of Economics has found that the changes he has introduced to benefits and income tax have seen the poorest five per cent lose income while the top one per cent have gained. Austerity economics have been a massive failure as the numbers behind today's statement show all too clearly. A short term housing bubble is the only fig leaf he has left to get past next year's election But there is also a challenge for the opposition parties and Labour in particular. There has to be a clear dividing line on economic policy. Austerity is the Tories cover for their real political goal of reducing the size and role of the state - it should not feature in the policy of a party with a democratic socialist mission. Politicians can be so fixated by the benefits of free trade that they are missing the real dangers of the Transatlantic Trade and Investment Partnership (TTIP). TTIP is a series of trade negotiations being carried out mostly in secret between the EU and US. In my view TTIP is primarily about reducing the regulatory barriers to trade for big business, things like food safety law, environmental legislation, banking and labour regulations. It is, as John Hilary, of War on Want, said: "An assault on European and US societies by transnational corporations." I was giving oral evidence to the Scottish Parliament's European and External Relations Committee last week on TTIP. It's not often in parliament that I find myself on the same side as the NFU, but that just demonstrates how broad the coalition concerned about TTIP is. There is an argument, put forward by an academic lawyer at the committee, that we are worrying too much. There can be no provisions in the treaty that are outside EU competences and the EU has no powers to direct how, for example, our health service is organised. With respect, this academic view of the law is simply naive. There are plenty of examples of states signing up to similar treaties only to find corporations challenging their democratic decisions. Australia over tobacco control and Slovakia over health insurance, highlights just two in the health sector. There are over 500 of these cases being heard across the world at present. It's not just the actual legal action that matters. The threat of legal action can result in 'regulatory chill' with risk adverse law officers worrying about any radical action that might result in a legal challenge. Scotland's recent Procurement Act and the living wage was one recent example of this effect. That Act also has provisions to tackle aggressive tax avoidance. Just imagine the plane loads of US corporate lawyers flying in to Edinburgh if TTIP was in place! Effective challenges to the EU also have to come from the member state and for Scotland that means the UK. In England they are creating a US style privatised health service, so would they really complain to the EU to save Scotland's very different approach? Some MSPs pursued the idea of a 'good TTIP' with us. I'm afraid that I don't hold out much hope for that. There are already very few trade barriers between the U.S. and the UK, so it's deregulation and privatising public services that interests rapacious American corporations. From a UK perspective there is little economic evidence of the benefits. When officials claim gains in the range of £4bn to £10bn, you know they are just making the numbers up. Even these figures take no account of job displacement and a further shift from wages to capital. At a minimum TTIP a would have to unequivocally exclude public services, possibly using the positive list approach to avoid definitional problems over what a public service is. There should be no common regulatory standards, because the US ones are generally too low. Enforcement procedures that are in TTIP a should include all the ILO standards, particularly the ones that the U.S. hasn't signed up to, such a collective rights. But the biggest issue is removing any Investor State Dispute Settlements (ISDS). These mechanisms give judicial protection only to foreign corporations and allow their massive legal departments to tramp all over democratically elected governments. In this way they would be able to reduce our food safety rules, privatise the NHS, challenge the Scottish Living Wage and weaken environmental regulations on issues like fracking. 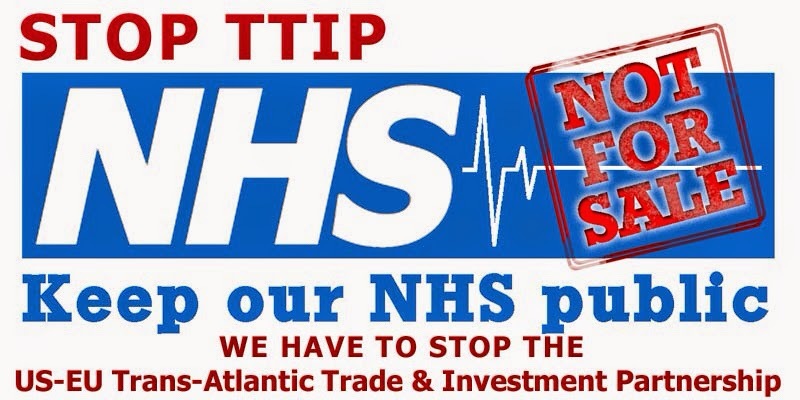 If a 'good TTIP' like this was on the table, I strongly suspect the US would just walk away. That's fine, because that is just what the EU should be doing now. The Smith Commission report is an important step forward on the devolution journey, even if many of us who support further devolution will be disappointed over its omissions. First of all let’s dispose of the political froth. It's impossible to know if the 'vow' has been delivered as, other than a newspaper headline, it was never clearly defined. At its worst it was the lowest common denominator between the various pro-devolution parties plans. At its best it was the highest common denominator together with some recognition that the independence referendum debate had moved the agenda on. It also appears from the polling that it had less effect on the referendum result than some claim. What it wasn't ever going to deliver was 'Devo-max'. Quoting opinion polls on particular devolution models is a pretty pointless exercise. Outwith constitution anoraks, most voters have at best a broad understanding of what is currently devolved and have a fairly general desire for greater devolution. This is a point helpfully developed by Lord Smith in his foreword. So what about the substance? The permanence of the Scottish Parliament and Government together with the Sewel convention being put on a statutory footing is an important constitutional statement. As is the devolution of election law that will allow the Scottish Parliament to lower the voting age to 16. The super majority for changes to the franchise is a sensible check and balance, given the absence of a revising chamber. The strengthening of inter-government mechanisms and a more formal consultative role is a useful step forward, although the full devolution of broadcasting and the energy market would have been a better approach. There is some devolution of energy efficiency, fuel poverty and onshore oil and gas extraction. This removes any lingering doubts over the Scottish Government’s ability to take a decision on fracking. Rail franchises are to be devolved, again removing any doubt over the power to allow public sector bids. It’s a pity that the Scottish Government acted too soon in handing the Scotrail franchise to a Dutch operator. Consumer advocacy and advice is a welcome devolution although there was a strong case for going further on consumer protection. Pensions and Universal credit (UC) rightly remains reserved. There is only a limited devolution of Housing Benefit that falls short of separating it from UC, which would have been a much better approach. This has the potential to be an administrative mess and will limit local authorities ability to direct all housing issues in their area. A range of other benefits outwith UC are to be fully devolved and Parliament will have the power to introduce new benefits and top up existing ones. Devolution of the work programme is welcome and will have implications for Skills Development Scotland and local authorities. The failure to also devolve the National Minimum Wage and equalities legislation is very disappointing. Tribunals are to be devolved but not the substantive laws they administer, including employment law. Again a mistake, but it should allow the Scottish Parliament to take a different approach to the iniquitous employment tribunal fees. Further consideration is to be given to operational control of health and safety, which is even weaker than the Labour Commission’s half way house. Financial responsibility has inevitably been the focus of attention and income tax is to be devolved. This is welcome and gives the Scottish Parliament the ability to mitigate the worst effects of austerity and English public service reform, as well as a more progressive system. There are some petty and unnecessary restrictions on personal allowances, savings and dividends etc. This is clearly aimed at avoiding any future arguments over ‘English’ laws at Westminster. National Insurance is to remain reserved and this could cause difficulties as they tax similar incomes. Assigning the first 10% of VAT is a fairly pointless cosmetic exercise as there are no powers to vary the rate. Air Passenger Duty and the Aggregates levy are to be devolved. This is sensible although there is a debate to be had over the climate change consequences. Business and consumption taxes remain reserved as UNISON and others argued. The Barnett Formula will remain together with a fiscal framework based on a neutral starting point. This appears to be broadly what UNISON proposed, although the detail will need to be worked out. There is a complex and confusing section on enhanced borrowing powers that mentions the prudential regime we argued for, but not confirming it. The Treasury’s dead hand can clearly be seen in the many caveats in this section. Overall, there is no doubt that this is a significant shift of powers, particularly fiscal, and the reaction from English cities illustrates that point well. For those like UNISON who argued for a more radical programme, there are important omissions. Energy, employment, equalities and others should be devolved if the Commission had applied the subsidiarity test we argued for. The failure to properly devolve the administration of Housing Benefit, damages what is other wise a sensible package of welfare devolution. While outwith his remit, Lord Smith makes a helpful statement on the importance of devolution beyond Holyrood to local communities. He also makes the case for parliamentary reform to strengthen scrutiny. The next stage is to turn the Heads of Agreement into draft clauses by 25 January 2015. However, there should be a broader public engagement exercise to consider this agreement. An opportunity to correct the shortcomings in what is otherwise a fairly reasonable compromise agreement. The Scottish Government's legislative programme is the predictable mixed bag. Some positive bits, some prospects of action and some significant disappointments. The eye catcher was land reform. Not as radical as the review group recommended, but the proposals were helped by the bleating from the landowners - who can be guaranteed to make even modest plans sound radical. The business rate anomaly is a genuinely positive step forward. An independent commission to find a new way forward on local government finance is at least a welcome recognition that we need to find a political consensus on this difficult issue, something that UNISON has called for. Given that the Burt Commission has already done the heavy lifting on this issue, I hope the timescale can be shortened. The Poll Tax debts bill is a nice bit of political froth, given that more people will 'disappear' from the register due to the single person discount than any council chasing poll tax defaulters. Commitments on NHS funding are all well and good, but continuing the regressive Council Tax freeze means that councils will continue to take the brunt of cuts. The small business bonus remains a waste of resource, with no evidence that it's done anything for jobs or investment. A few pennies for delayed discharge, especially when councils are expected to match the funding, will do nothing for the national disgrace that is our social care system. Some very modest support for carers is of course welcome, but the big issues are simply ducked. Devolution of powers to the islands looks promising. It would be even better if this was extended to all local government, rather than the centralising tendency! Community Justice to local government is welcome, although we need to watch carefully for ministerial powers of direction, to ensure that this is proper local accountability, not just administration. More cash for the Scottish Living Wage accreditation scheme is welcome along with more ambitious targets. The big gap is on procurement and the statutory guidance is promised "in the next year". There is no excuse for the delay in getting on with this now - next year sounds like very long grass. The Fair Work Convention and Scottish Business Pledge is a welcome statement of intent that a better approach to industrial relations is possible in Scotland. A practical implementation test would be the inclusion of union representatives on public bodies, as recommended by the Mather Commission. Strengthening childcare, improving literacy and access to Higher Education are all important elements of a meaningful social justice agenda. So is access to further education, something missing from the statement. Modern apprentices are not always all they should be. Abolishing tuition fees is the right policy, but it hasn't done much for widening access. So setting targets and a commission is at least a process step forward. Finally, we had the tired rhetoric of the 1000 extra police officer target. Police officers sitting behind desks, substituting for police civilians who do a better job at a fraction of the cost is absurd. Then to moan about VAT, when they had an opportunity to structure the new force in such a way to avoid this additional cost, is rank hypocrisy. In summary, as is often the case with this government, today's statement was stronger on process than substance. However, there are aspects of the process that at least point in the right direction and offer up the prospects of better policy on some key issues. Fracking is back in the news with the announcement that Ineos, the owners of the Grangemouth plant, has £640 million plans for shale gas exploration and appraisal. It already has two licences for extracting from under the ground near its Grangemouth refinery, but is applying for more in Scotland and the north of England. Ineos is facing strong community protests on the grounds that the techniques are unproven and risky. Others argue that Scotland should be focusing on clean energy rather than fossil fuels. 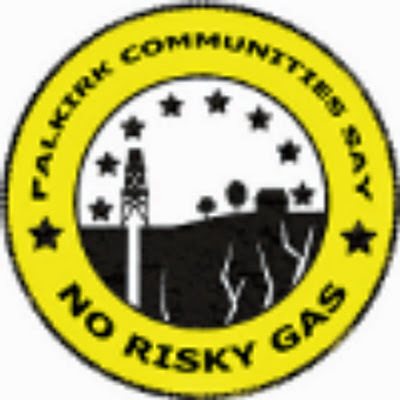 A coalition led by Concerned Communities of Falkirk (CCoF) and Friends Of The Earth Scotland, including the trade union UNISON, are demanding a moratorium on unconventional gas development in Scotland, saying risks to public health, staff and the environment are "impossible to regulate away." Labour's shadow energy minister Tom Greatrex, said: "Shale gas extraction cannot go ahead unless we have a system of robust environmental regulation and comprehensive inspection." He also accused the Coalition Government of sidelining legitimate environmental concerns. Top scientists have also warned that fracking will not stop climate change and could lead to 11% higher greenhouse gas emissions by 2050. They identify a possible scenario that the boom in shale gas may have no effect on carbon dioxide pouring into the atmosphere over the long term. Five computer models assessing the impact on global warming projected that, despite natural gas consumption increasing by up to 170 per cent by 2050, changes in CO2 emissions would range from a 2 per cent reduction to an 11 per cent increase. So while there is a consensus on devolution, the Scottish Government already has planning powers that could end the prospect of fracking in Scotland now. They have used these powers to stop new nuclear power stations, but not fracking. Simply put, Ineos are making this level of investment because they are confident that the Scottish Government is not going to stand in their way. My Gran used to say, ‘all politicians are the same’ and as a consequence voted for the candidate whose eye brows were the furthest apart. While the eye brow test may be unique, sadly, her view of politicians is something every party canvasser has heard many times on the doorstep. As ballot papers for the Scottish Labour leadership election drop through the letterbox this week, we do at least have a real contrast in both approach and policy. The polls make grim reading and anyone who really thinks Scottish Labour can recover simply by improving spin and presentation, is now bordering on the delusional. This was reinforced to me in a series of discussions with UNISON members recently. The points I reflected in my last blog post on this issue were repeated many times. Another of my Gran’s favourite sayings was, ‘fine words butter no parsnips’, meaning that fine words count for nothing and that action means more than flattery or promises. Her words were a recurring theme, put in more direct 21stC language by member after member. They are fed up with vague generalities and want action. I was thinking she, and they, might have had a few choice words for one of the candidates in last night’s BBC hustings on this point! That leads me to the question of policy. Yesterday’s Survation poll shows a growing number of voters saying that they would shift their support back to Labour, if the Labour Party supported the sort policies advocated by Neil Findlay and Katy Clark. From my own discussions with members I would add housing. Neil’s pledge to build 50,000 social houses for rent was just the specific and necessary action they were looking for – particularly the younger members who see no way into decent housing. These numbers really matter because on current polling data, just defending the core vote won’t be nearly enough – even allowing for the likely bounce back when a new leader is elected. As Survation says: “This poll of SNP voters suggests that all is not lost for Labour if the party adopts a number of bold and progressive measures”. Neil and Katy are arguing for just such a radical programme. They are credible, because they haven’t just produced them for this campaign, contradicting their past voting record. They have been longstanding advocates of change. In Scotland these are now mainstream views. If they look left wing to some, well that simply reflects how far away from the mainstream they have moved. It’s politics as usual that will lose Scotland for Labour. We need to win back the missing Labour voters and we will do that, not with professional politicians, but with authentic leaders promoting radical policies that will make a real difference to people’s lives. That’s why I am voting for Neil Findlay and Katy Clark. Trade union members can show their support for Neil and Katy at Change for Working Scotland. Scottish Labour needs an authentic voice to win back support and that's why I am supporting Neil Findlay as the next Leader of Scottish Labour. The days when voters could be won with spin and little substance are long gone. Professional politicians have a lexicon all of their own. They are listening, even when they patently are not. They are in favour of good things and against bad. They care about 'hard working families' and other such meaningless banalities. So when they say they are concerned about 'social justice' or 'children and families', voters say fine but what are you actually going to do. 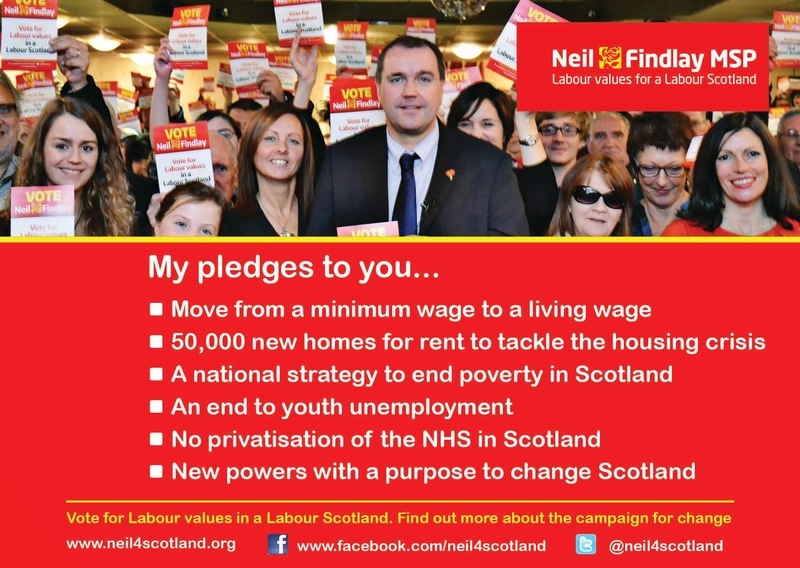 In contrast, Neil Findlay says, 'we will build 50,000 homes and ensure everyone is paid a living wage'. Straight talking and practical solutions. Of course we are listening, but we are going to do something about the gross inequalities in our society as well. The other problem with the spin culture in the Labour Party is that it's all too often directed, not at political opponents, but at comrades. The constant briefing against Johann Lamont in recent months 'by friends of' is just the latest example. If Neil Findlay has something to say to you, he says it to your face. We need a leader who will lead by example on this point. To Neil, politics isn't some game or a profession to be learned in student politics and refined as a parliamentary researcher. He was a bricklayer, who benefited from a real apprenticeship and then used the opportunities a Labour government provided to become a housing officer and then a teacher. His politics were forged in his own working class community, refined as a local councillor and a shadow minister, and he has never abandoned them. That's why his passion comes through, not in glib sound bites, but in the language people understand. I have seen so many professional politicians talk to our members and when they move away the member says, "they were very nice, but what are they actually going to do?" When the Daily Mail attacked the 'wit and wisdom of comrade Neil', the reaction of most people I spoke to was - that's brilliant. I particular liked his retort to a Tory MSP on Thatcher's record on mine closures, he said, "Presiding Officer, you will have to excuse me as I wipe the vomit from my chin having listened to Murdo Fraser's rewriting of history". Most of our supporters hearing that would be cheering! I have a lot of respect for Jim Murphy's achievements in winning and holding a constituency that would be safe Tory seat in England. However, Newton Mearns is not typical Scotland. We have to win back support in Glasgow, Clydebank and many other areas that have very different problems. The 20 year old 'New Labour' textbook just won't hack it any more. 'Triangulation' only starts to work if you have a core base to triangulate on. Labour is at risk of losing that base and we have to start by offering real solutions. Ever since the New Labour era, many Labour politicians sound timid and unsure. Predistribution is the right policy, but instead of just asking bad employers if they would stop taxpayer subsidised poverty pay - we should say, 'we will raise the minimum wage to the living wage'. Instead of saying, 'we will see if we can build a few more houses' - we should say, 'we will build the 10,000 homes a year Shelter say we need'. 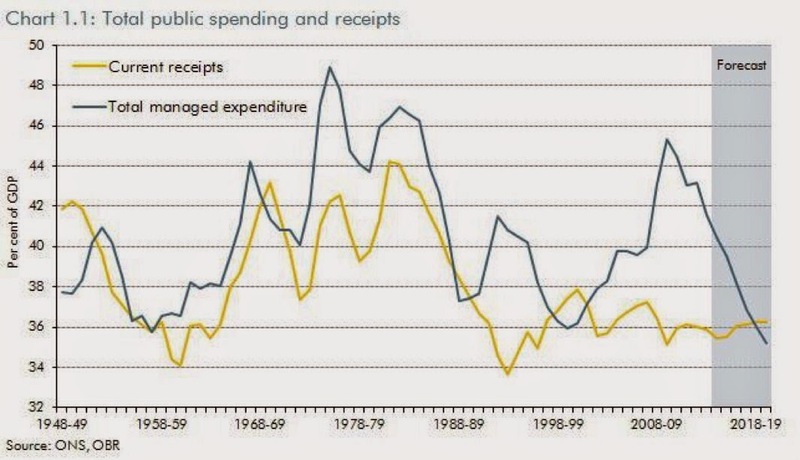 And by the way neither of these policies need have a net impact on public spending. Now, some people say the 'New Labour' textbook has worked for the SNP. Of course they have adopted much of it and there is often a gap between their rhetoric and delivery. However, the difference is that they can and do blame any and all delivery failure on wicked Westminster - although even this will wear thin eventually. I would also say, is power without purpose what most of us joined the Labour Party for? No, we want power and we want to do something with it. Neil also comes without negative political baggage. Labour's political opponents can't say, he voted for or did any of the unpopular policies associated with past Labour governments. This means he can focus on the future, not spend all his time defending the past. It is not surprising that the establishment is not supporting Neil. His politics are a challenge to the politics as usual that they are comfortable with. But Neil is no wide eyed 'leftie', he can be just as scathing about fantasy politics on the left as he is when attacking the real enemies of working people. He can build a broad coalition of support for a fairer and more equal Scotland, because many of those doing well can understand that a more equal society benefits everyone. Neil Findlay is not a perfectly groomed professional politician, with a ready sound bite for every occasion. But in the current political environment that's a strength, not a weakness. He's the real thing. An authentic politician of the sort that Labour used to produce in droves - before politics became a career choice. That's why I am supporting Neil Findlay for Leader and I hope you will too. Community energy provides an opportunity to diversify Scotland's energy ownership from the dominance of big energy companies. The Scottish Government has published a Community Energy Statement that sets out the measures they are taking to encourage the development of community energy. The Scottish Government's ambition for community energy is that it provides an opportunity to spread the benefits of the rich energy resource with which Scotland is blessed. Support for community projects reflects their importance in empowering communities to take control of their own destiny and make the most of their own local resources. Community energy covers a spectrum of activity – from direct ownership of energy assets, through joint ventures to community benefits payments. These enable communities to take a stake in the full range of heat and electricity generating technologies, from onshore wind, to solar PV and solar thermal, hydro, biomass and heat pumps. The ambition is to see a fairly modest 500 MW of renewables in community and local ownership by 2020. This has been independently estimated to create some £2.2 billion over the operational lifetime of those projects. There is already 285 MW operating in 2013, including 43 MW of community energy. Most benefit comes from community benefit payments made by commercial developers. In the past 12 months this amounts to about £6 million from over 3 GW of (mainly) onshore wind schemes. While the cash is no doubt welcome to the communities concerned, this is not community ownership. Support for community energy is currently delivered through the Community and Renewable Energy Scheme (CARES) delivered by Local Energy Scotland, and the Renewable Energy Investment Fund (REIF) delivered by Scottish Investment Bank. These schemes provide funding and technical support. While these initiatives are welcome, fully functioning direct ownership is limited to small scale, mostly rural hydro and wind farms. Continuing down this path is unlikely to deliver a radical change in energy ownership in Scotland. There are substantial barriers to this form of community ownership as the Statement recognises. Not the least of which is the UK government's volatile energy policy. Long term investment in energy needs a stable pricing regime. Another is the speed of connection to the grid, something that other European countries accelerate through public ownership of the grid. Experience from Europe indicates that to make serious steps in diversifying ownership requires new public sector entrants to the market, primarily local authorities, although Scottish Water could also be a bigger player. The Statement recognises that the formation of Local Authority Energy Supply Companies (ESCOs) may be an opportunity to improve competition and offer a wider range of tariffs. CARES support has recently been awarded to Comhairle nan Eilean Siar to explore the potential to establish an Outer Hebrides Energy Supply Company (ESCO), which could enter the UK electricity market in 2016-2017 retailing green Hebridean electricity to local and export markets. The next big step requires new municipal entrants to the energy market in urban areas. Cities should be engaging in the energy supply market where this can support efforts to tackle energy affordability and promote local generation. The Institute for Public Policy Research paper 'City Energy, A new Powerhouse for Britain', July 2014 showed one way forward. This Scottish Government Statement is a reasonable description of the relatively small scale efforts made to date to encourage community energy ownership. However, the ambition is modest, lacking proposals to seriously diversify ownership in Scotland. The next big step requires support for local authorities to return to their 19th century role as an energy provider. They can do this on their own or in partnership with cooperatives. This model brings significant benefits to communities across Europe with lower energy prices and income generation for public services. I set out this approach in more detail in the energy chapter of the Red Paper on Scotland. For all the words in this latest publication the reader is left with the overwhelming impression that the Scottish Government is not in the business of taking on the big energy companies. As they have not been over energy retail prices. A few rural wind farms in community ownership is not going to make the radical diversification we really need. NHS in Scotland is facing significant pressures at the same time as having to make major changes to services to meet future needs. 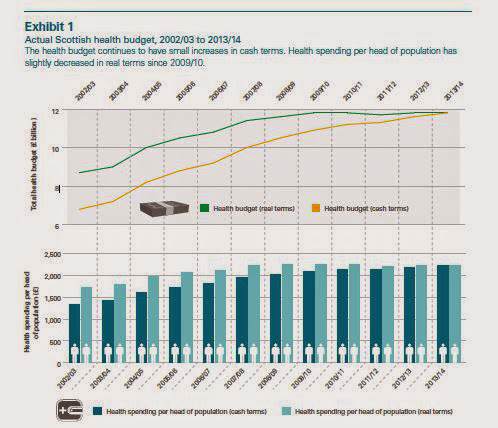 That's the key message from the latest Audit Scotland report on NHS finances. This infographic sums up the pressures. They also found evidence that NHS boards are finding it increasingly difficult to cope with these pressures. NHS boards’ revenue budgets increased by just over one per cent in real terms in 2013/14, and smaller real terms increases are planned from 2014/15 onwards. Cost pressures, such as the growing costs of drugs and other health technologies exacerbate this tight financial situation. This table shows that while spending overall has increased in cash terms, spending per head of population has decreased since 2009/10. While resources are falling in real terms, the demands on the NHS are increasing. This is as a result of demographic change, particularly the growing population of elderly and very elderly people; the number of people with long-term health conditions; and people’s rising expectations of healthcare. Audit Scotland conclude that it will be challenging for the NHS to make the scale of changes required over the next few years to meet the 2020 Vision strategy. In particular, progress has been slow in moving more care into the community - a process not helped by council budget cuts. They point to pinch points in the complex health and care system with only three boards meeting the delayed discharge targets. It remains to be seen if health and care integration will tackle these. While all NHS boards met their financial targets, several required additional funding from the Scottish Government or relied on non-recurring savings to break even. NHS Highland, NHS Orkney and NHS 24 had particular difficulties. Five boards are relying on non-recurring savings to meet efficiency targets. A classic indication of NHS cost pressures is the backlog of maintenance required to ensure that hospitals and other buildings are fit for purpose. In 2012, the Scottish Government forecast that the cost of this backlog would decrease by £174 million by 2013, from £948 million to £774 million. The actual reduction was £90 million, to £858 million. 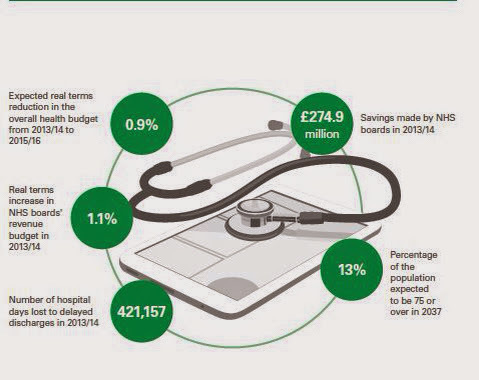 The NHS capital budget available to boards fell by 21% between 2012/13 and 2013/14, from £605.5 million to £481.3 million. In a separate announcement the Scottish Government has announced a big PPP/PFI programme. This expensive form of finance is funded from revenue. In addition, despite significant efforts, the NHS did not meet some key waiting time targets in 2013/14. The report highlights a range of pressures including a significant increase in outpatient appointments. Audit Scotland argue that the current level of focus on meeting waiting time targets may not be sustainable when combined with additional pressures of increasing demand and tightening budgets. There has been a reduction in the number of hospital beds across Scotland. Between 2008/09 and 2012/13, the average number of available staffed beds in acute specialties reduced by 7% (1,144 beds); the number of acute surgical beds fell by 11% (596 beds); and the number of acute medical beds fell by 5% (313 beds). The main reason given for this reduction is the growth in day surgery. The report highlights a range of staffing pressures, particularly amongst medical staff. NHS Scotland spent £128 million on bank and agency nursing and midwifery staff in 2013/14, an increase of 15% since 2012/13. Spending on agency staff increased by 46%, to £9.3 million. This follows a rise of 62% the previous year, reversing the trend of falls in spending on agency nurses since 2008/09. Agency staff are likely to be more expensive than bank nurses, and also pose a greater potential risk to patient safety and the quality of care. Overall, this report gives a good overview of the financial state of NHS Scotland and its constituent boards, shorn of the usual spin. In short, it's tough now, but it's going to get a lot worse. During Living Wage Week we should focus on ensuring that the 400,000 workers in Scotland on poverty pay are paid the living wage. The idea behind a living wage is very simple. A worker should be paid enough to live decently and to adequately provide for their family. It helps prevent in-work poverty and ensures workers are not exploited through low wages. The Scottish Living Wage is good news for workers as they get higher wages that also improves their health and job motivation. It’s good for employers because it reduces turnover, improves productivity and attracts better staff through reputational gain. The wider community benefits through lower benefit cost, less stress on the NHS and cash into the local economy. The Institute of Fiscal studies has calculated sub-living wage employers cost the taxpayer £6bn a year in in-work benefits alone. The indirect cost on poverty is around £25bn a year. This year’s Living Wage Week got off to a good start with a 20p increase in the rate to £7.85. That means a much needed pay rise for those on the living wage. That includes most of the public sector in Scotland and a growing number of private sector employers who have signed up voluntarily. The energy company SSE has been a champion of the living wage in Scotland this year and they have been joined by high profile firms including Nationwide and Heart of Midlothian Football Club. Celtic have yet to follow, but there is a great grass roots campaign pressing them at every opportunity. Of course its women who are the main victims of poverty pay. 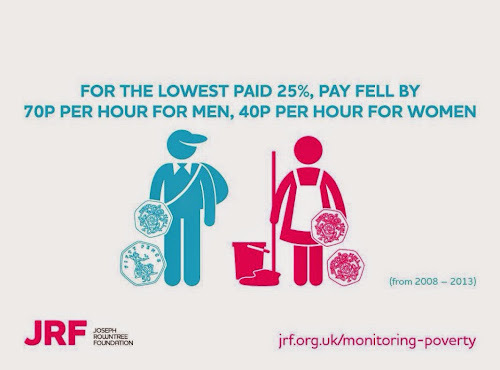 Today is Equal Pay Day, marking the point at which women working full-time effectively stop earning as they are paid £5,200 (15.7%) less per year, on average, than men working full-time. Equal Pay Day for women working part-time was way back on 28 August. Research published last week by the World Economic Forum revealed that the UK has fallen out of the top 20 most gender-equal countries in the world for the first time after women’s incomes fell by £2,700 over the past year. The UK is now behind Nicaragua, Bulgaria and Burundi for women having an equal chance of a good education, career and health. And it’s not just women. Young workers, part-timers and black workers are all more likely to be on poverty pay. The Scottish Government is to be commended for including the Scottish Living Wage in their pay policy and for supporting the Scottish Living Wage accreditation initiative. However, it is through procurement that they could do much more to extend the scope of the living wage in Scotland. Promises were made during the passage of the Procurement (S) Act that have not been delivered. Our experience on the ground shows that public bodies are not even abiding by the current rules - so we need to get a move on with developing the statutory guidance. In this briefing I set out how we could make progress now. Labour also needs to be more radical. Ed Miliband’s plan to raise the National Minimum Wage (NMW) to £8 by 2020, won’t do a lot for workers below the living wage after you take into account rising inflation. UNISON and others, in submissions to the Smith Commission, have argued for the devolution of labour regulation including the NMW. Scottish Labour, under a Leader like Neil Findlay, could be much bolder. Helping families out of poverty and saving the taxpayer from subsidising bad employers.